These hoops look, feel and perform just like the OEM Tajima hoops. They are great choice for replacing damaged or lost hoops at a huge savings. The HoopMaster's many patented features make hooping easy, faster, and more consistent. You can document logo placement for quick setups and more consistent placement. 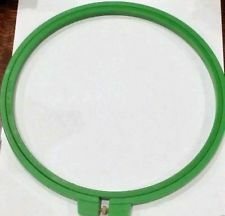 The Mighty Hoop is a new magnetic hoop that makes hooping very easy. There is no need to adjust the outer ring as the hoop holds the garment with magnetic force and automatically adjusts for different thicknesses. Hoop Tech has been supplying the Embroidery Industry with a broad range of products and services that help maximize both productivity and profits. Allied International has served the embroidery industry for over 30 years. Allied Grid-Lock™ hoops have a patented design with unique features including visual grid lines and reference markings used for alignment and other cost saving features.